Resistance: fire, all non-magical slashing, piercing or bludgeoning attacks. Magic Resistance: the battle platform rolls advantage on magic saving throws. Indomitable: When the battle platform reaches zero HP it continues to function with only a single action until it takes additional damage equal to its CON score (22). When at zero HP it is unable to use its maelstrom generator and begins leaking radiant energy (see Reactor Leak, below). Multiattack the battle platform can strike with any combination of four hammer arm or bolt rifle attacks per action. The battle platform may instead initiate one bolt spray or maelstrom generator attack in place of multiattack. Ranged attack – Bolt Rifle +8 to hit (range 120 ft), hit 4D8+2 piercing damage. Ranged attack – Bolt spray +7 to hit (all targets in a 60 foot cone), hit 4D8+2 piercing damage each. Living Construct: The animate is a living construct, and does not need to eat, breathe or sleep, though an animate with spell casting ability will need to meditate. Animates are immune to poison and disease. Living contructs do have an animating spirit, however, and intelligence. As such they are not resistant to mind altering effects. Elemental Imbuement (fire): animates may imbue themselves with resistance to one elemental type. The sample guardian is imbued with fire, but this can vary among any of the elemental types. 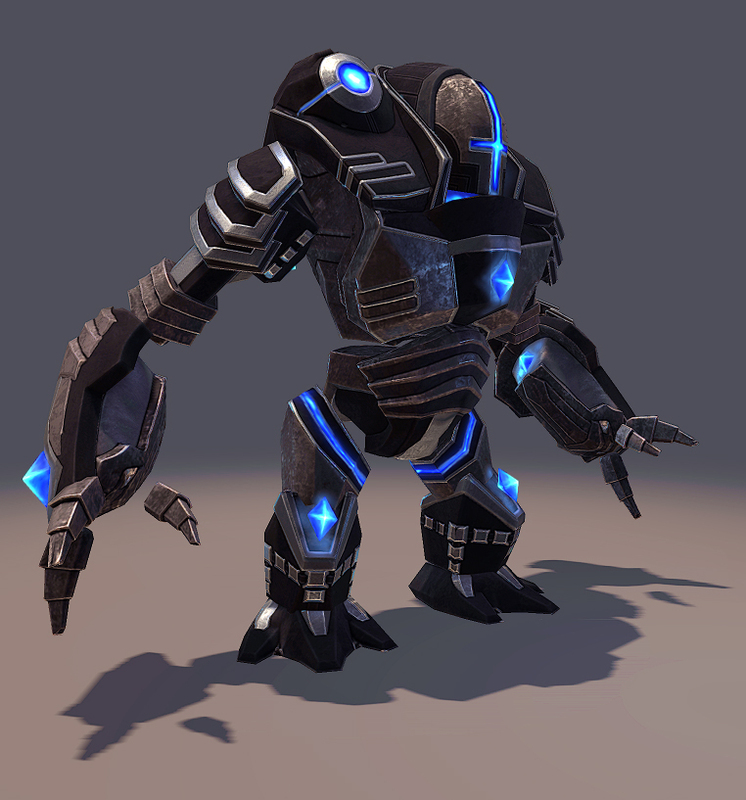 Armament: The battleform’s hammer arm and bolt rifle are attached to its arms, and cannot be removed except by force. The bolt rifle has a reloading chamber built into the animate’s forearm which carries up to 400 steel bolts at a time. Some guardians have these bolts enchanted (in the same fashion as enchanted arrows). The animate can fire its bolt rifle multiple times per round, and the battleform version has a range of 400 feet. It can spray a conical area for maximum effect (bolt spray attack). Reactor Leak: A Battleform which has taken damage reducing it to zero HP begins to release dangerous waves of radiating elemental energy. Each round the battleform will radiate sickening radiation. All creatures in a 30 foot radius (Constitution DC 19; 2D8 radiant damage per round of exposure and weakened; must make a save on any round starting in or moving through the 30 foot radius). The effect ends 1D6 rounds after the animate ceases to function, when the elemental portal in its core closes. Maelstrom Generator: Battleforms can charge up their elemental soul and release it in a torrent of energy from their internal generator pack. They lose this ability if they have reached zero HP, however. This attack requires time to recharge between uses, but is otherwise unlimited (it taps directly into the elemental planes). Unique Treasure up to 50,000 gold pieces in salvageable alchemical and magical parts that can be used in enchantments or as spell components can be harvested from a guardian animateis remains. An Arcana check (DC 17) can reveal 1D6 rare spell components for spells of levels 6-9. An even larger and more vicious looking version of the guardian, the battleform is usually modeled after dragons, manticores, and other four-legged monsters. They are much like guardians in that they are covered in thick metal plates, engraved with runic warnings in Old Mythric, and suffused with radiant elemental energy pouring from the cracks and seams of their armor. Animate battleforms are (according to some artificers who study the animate culture) no longer being made, at least not in Beltraine (there is plenty of evidence that the Black Dome churns them out regularly). 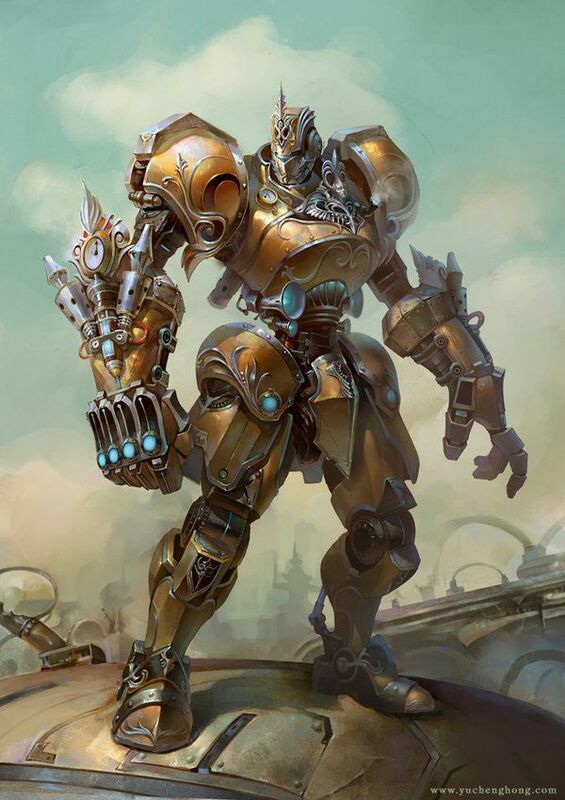 The majority of battleforms which exist today are ancient relics from the time of the apocalypse, the last Great War machines of old employed by the vast armies summoned to the defense of the twelve gods. Although their memories are faulty at best after only a few centuries of use, a handful of surviving battleforms claim to remember some brief details of that ancient time period, and love to recount stories to those who they are certain are not foes. Most battleforms display a keen sense of wisdom, even if they lack the driving force of intellect found in the collector models. Usually only seen patrolling the perimeter of approach to an animate enclave, or deep in the bowels of a subterranean animate city, the battleforms are the ultimate defense of the land, vicious bruisers who will destroy anything that is not permitted within the limits of the city proper. I can't stress enough how much I've needed this book. Not even in a "I didn't know I needed it until I had it," kind of way. But rather, a "I knew I needed this since 5E came out in 2013 and have been limping along without it," kind of way. So, a thousand thanks to Wraith Wright Productions for putting this book together, it is worth it's weight in gold. The Comprehensive Equipment Manual is the best tome I have yet acquired from DmsGuild. The game provides an enormously comprehensive list of gear from the PHB and then expands outward to incorporate just about everything under the sun imaginable, including a few items you might not have imagined. 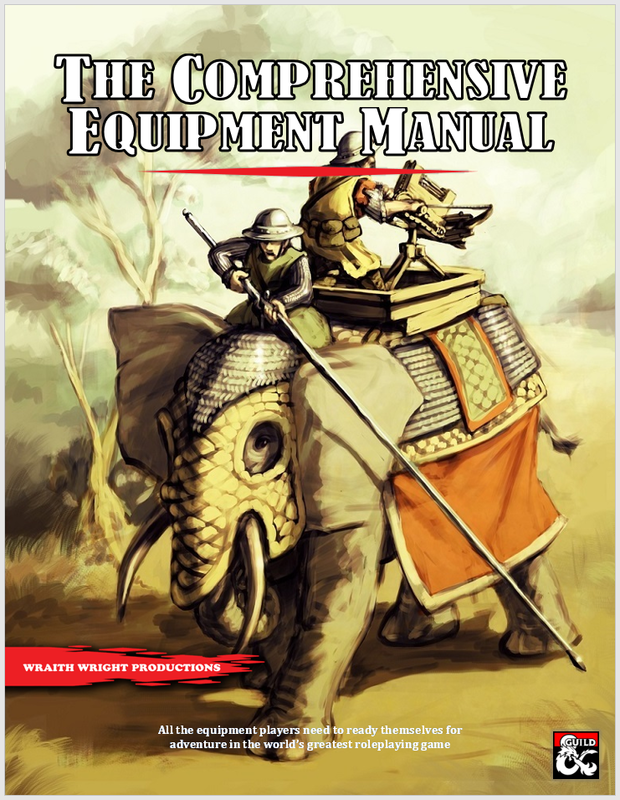 It breaks down weapons and gear by conventional and then later exotic types, with a lengthy section on the stuff any campaign might find agreeable, then a special series of entries on gear by unique (exotic) campaigns, which include east Asian, renaissance period, primitive and many other options to fit what you need. Most all campaigns seen in previous editions of D&D can benefit from these special exotic subsets of gear. Loaded in here includes material to support robust campaigning in the age of sail, firearms from several time periods, metal-poor gear environments for settings like Dark Sun and much more. All of it is very, very comprehensive and gives you everything you could need to apply to your specialized setting. Take Monster Markets. This subsection of exotics is a fine example. Imagine you have need of information on the sale and use of magical beasts in your campaign. This is something you as DM need to scrounge up details on for the most part in straight 5E, but with this book there are numerous, comprehesnive detailed lists on the sale and use of these monsters as beasts of burden or war. The book delves into wealth, and a range of interesting new coinage options. It talks about craft components, about setting up trade and barter economies, all in a friendly and accessible way with plenty of charts for the DM that are user friendly. It dives in to non-material assets such as property and fleshes out this detail that is only sparsely addressed in the core rules. It evaluates lifestyle expense, and breaks down wealth acquisition in the game as well as a detailed review of treasure distribution. If you love trinket tables, this game loads you up with a bunch of new tables, tailored to low magic and gritty settings, mid tier, high fantasy, primitive and alternatives. This section alone is worth a close look. If you've been craving an actual "magic item as commodities" expansion for your games, this has exactly what you have wanted, with an elaborate set of pricing, markets, and discussion on why it all works the way it does. More elaborate discussion on identification of items is provided as well, and a vastly expanded series of tables to identify the unique quirks and properties of magic items are also provided. Finally, rounding out the book is a section on actual things your PCs can buy and invest in. From towers and keeps to armies and ships, all the details you need to reclaim the lost glory days of what to do when you were a 9th level character are here, in depth, 5E style. Are there downsides? The biggest downside is probably a "praising with faint criticisim" as I suggest that this book has too much goodness, and integrating it all in your regular game could cause a system shock for your players. Beyond that, the art in the book is fine, but it's kind of....basic. But it is original, and in color, and has a sort of odd "historical" style to it that works despite feeling like much smaller illustations blown up for effect. That's all I've got on the "bad." My opinion....this needs to be an official core book. If WotC ever decides to "canonize" a DMs Guild product and make it official, this one deserves that praise. Check it out. Magic Resistance: the guardian rolls advantage on magic saving throws. Machine Logic: Guardians are hardened against mind-affecting spells and magic and are immune to all such effects like normal constructs. Multiattack the guardian can strike with any combination of three warblade or bolt rifle attacks per action. The guardian may substitute one fire spray for a warblade or bolt attack per action. Ranged attack – Bolt Rifle +5 to hit (range 120 ft), hit 2D8+2 piercing damage. Ranged attack - Fire Spray (4/day) (all targets in a 30’ cone) 4D8+8 fire damage; Dexterity Save DC 16 for half damage. Armament: The animate guardian’s bolt rifle and warblade are attached to its arms, and cannot be removed except by force. The bolt rifle has a range of 200 feet. It has a reloading chamber built into the animate’s forearm which carries 100 steel bolts at a time. Some guardians have these bolts enchanted (in the same fashion as enchanted arrows). The animate can fire its bolt rifle multiple times per round. Intervention: The guardian animate is designed to protect collector units. So long as it is directly adjacent to a collector unit (or other chosen target for protection) the animate guardian can immediately extend its full DR and resistance to that target as if that target also had these defenses. Unique Treasure up to 20,000 gold pieces in salvageable alchemical and magical parts that can be used in enchantments or as spell components can be harvested from a guardian animate’s remains. These immense golems stand ten to fifteen feet in height and tower over most other creatures. They are suffused with radiant elemental energy and are always composed of dense metal plates. The first duty of the guardian model is to protect workers and collectors from harm. Some collectors journey out with a guardian unit to protect them. Sometimes, a guardian unit loses its way, fails to protect a collector, or simply suffers a sort of malfunction and finds itself seeking out others to protect, as it seems to have an overriding need to do so. The primary job of the wandering animate guardian is to keep its charge safe. In doing so it will use fire spray for crowd control, while holding its intervention maneuver in wait should it need to take a hit for the one it protects. It will not hesitate to destroy anyone who threatens harm. We had some players out tonight, so my wife offered to run a one shot. The game was a genre mashup (sorta) of the Cypher System Predation setting and my wife's general experiences distilled from a million hours of her playing Ark: Evolved (a survival game with dinosaurs in which even the game griefs you). 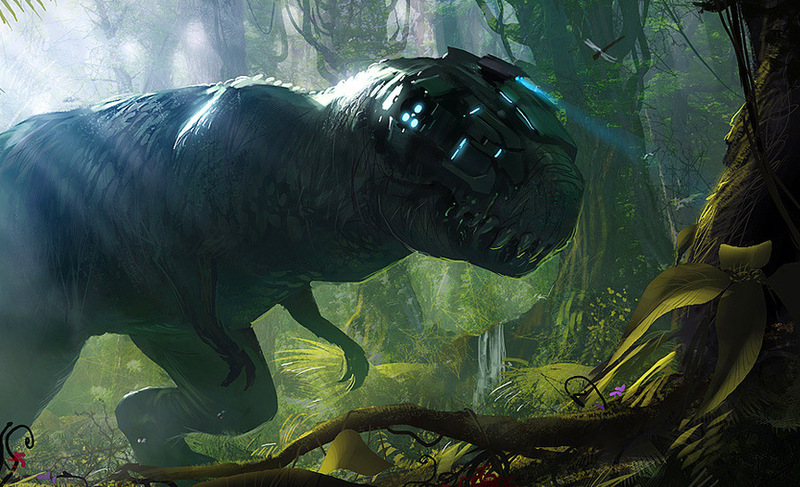 Several hours surviving on Dinosaur Island after aliens kidnapped us all from the timeline while we fought other survivors and survived various prehistoric encounters later, we wrapped with a "...to be continued" in our future. It was fun getting to play the game, rather than run it. I really like this game. It's infectious just how easy it is to do literally anything you want with it. I spent time thinking about how to carve out the Starfinder setting and style and make it a Cypher game. I mulled over trying out Fantasy AGE but kept going back to the new Numenera Discovery & Destiny books instead. I am thinking obsessively about how to get my Wednesday D&D group to drop D&D and play Cypher System instead, using my Chirak setting with the Cypher rules. Call of Cthulhu may be the only game that can break this curse. And hell's bells, I have spent serious time thinking about how to use Cypher for horror and historical gaming, too. 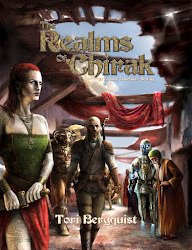 I finally finished the Animate write-ups for the bestiary section of the 5E edition of Realms of Chirak, which will hopefully see print before 6E arrives. Critiques welcome! 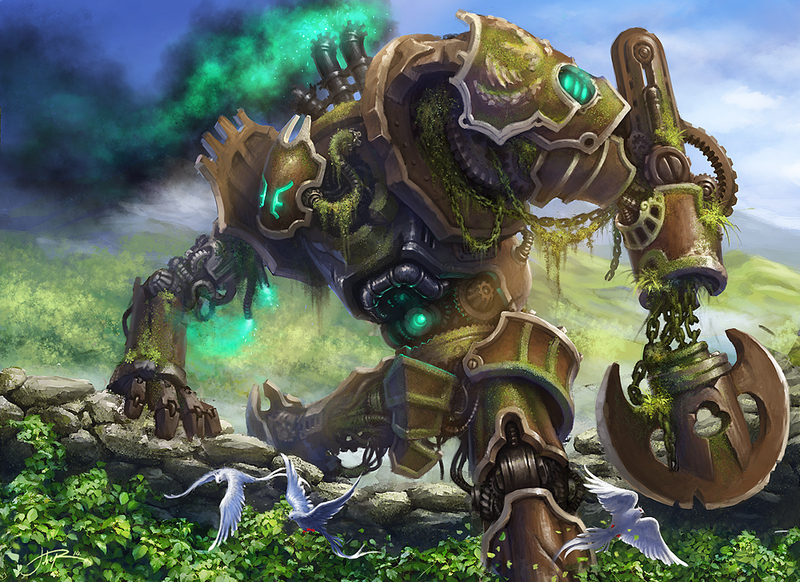 Animates are sentient golems who come from the dead wastes and ruins of the ancients. Some animates are called collectors, and seek to gather information on the Realms for mysterious purposes. Animates of Beltraine are friendly, but the animates of the Black Dome are inimical to biological beings. Artificers of sufficient talent and power can create animates, suffusing them with life via elemental energy. The only realm known for creating its own animates is Sabradan in the distant West. Although most, if not all animates that are encountered by humans are of the “collector” variety, there are in fact a variety of unique animate makes and models in the world. Collectors are viable as player characters (see chapter II) but other, more dangerous varieties can be found below. Unless a collector is accompanied by a guardian or similar model, the likeliest place in which to encounter these unusual animates are in their native lands, such as The Black Dome near Eristantopolis or Ruined Beltraine. Some of these encounters can be extremely hostile, depending on the intent of the animate in question, or its perception of threat on the part of the PCs. Animate Special Feats: animate PCs have range of feats animate collectors (and other models) can be equipped with. The following examples are based on the most common traits, but are by no means the only configurations encountered in NPCs. Ranged attack - Fire Spray +3 to hit (reach 15 ft, three targets in cone range), hit 2D8 fire damage, reflex save DC 11 for half damage. Lightning Slowness: Animates are reduced to half moving speed for one round when struck by lightning, and in that round they cannot take bonus actions or reactions. Elemental Imbuement (fire): animates may imbue themselves with resistance to one elemental type. The sample collector is imbued with fire, but this can vary among any of the elemental types. Armor Up. Animate collectors can “seal” their armor in reaction to an attack that they are aware of. The target gains disadvantage on the attack. This attack can be performed against any incoming strike the animate is aware of until the animate actually takes damage, at which time it is no longer able to effectively armor up until it repairs itself. 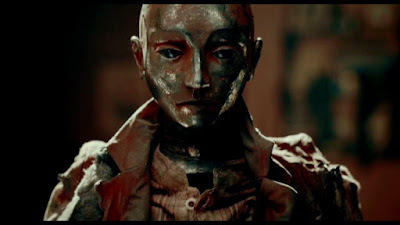 Animate collectors are the most human looking of the sentient golems, usually appearing as lavishly decorated humanoids with etched skin made of bronze, gold, wood and ceramic plates. Their bodies are composed of a curious mixture of clay, plastic-like substances, woolen material and these black strands of an unknown carbon-like substance that radiates elemental heat. Collectors really don’t like to fight, although they are equipped for it if necessary. Their primary function is to observe, record, and learn about the many cultures of Chirak, and if forced to confrontation the animate will seek only to defend and avoid hurting others. Not all animates are like this, however. Some rogue collectors, or animates from the Black Dome seem to look down on organic biological beings as less than worthy, and show an utter disdain for the lives of others. Such collectors are often found in league with the Arcanists, seeking out lost and forbidden secrets for exploitation. Among all animates, collectors are the only type which is treated for game play purposes as if it were a true humanoid. As such, the rules for collectors are based entirely on the character creation rules in Chapter II. All other animates are built as living elemental construct monsters. Multiattack the worker drone can strike with two fist attacks per action. Elemental Imbuement (fire): animates may imbue themselves with resistance to one elemental type. The sample worker drone is imbued with fire, but this can vary among any of the elemental types. Animate workers are usually found deep in the belly of animate cities such as Beltraine. 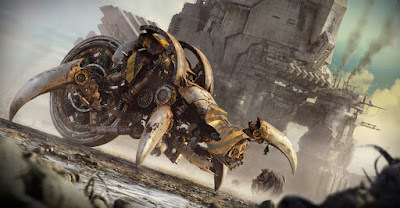 These gangly, lean mechanicals are comprised mostly of clockwork mechanisms, rubbery joints, wooden slat carapaces and streams of flowing, radiant elemental energy. The type of energy is usually a giveaway as to the nature of their driving elemental force. They rarely seem to have much intelligence to their actions, instead following whatever obscure programming they have been direct to carry out. Worker drones that somehow get loose or find themselves lost in the surface world of squishy biologicals often have mental breakdowns, being unable to properly process the data they experience. As such they are rarely deliberately seen outside of actual animate communities, and those few that wander the land tend to act very strangely, almost insane (and sometimes even become chaotic neutral in behavior permanently). Multiattack: flyers can attack up to four times with claws against targets in range with one action. Melee Attack – Claw +6 (5 foot reach, 1 target) 2D8+4 slashing damage and target must make a DC 10 save or is grabbed by the flyer. Multiattack: the digger may strike with two fists or one fist and a drill. Melee Attack - Digger Drill +6 attack (reach 10 feet up to 2 targets), 4D8+4 piercing and slashing damage and target is knocked prone. These struck me as the three things that D&D has which can, despite their contribution to the game experience, slow down the overall role-play/story engagement. They work great on tired nights when I, as DM, would like to relax a bit.....just throw a big combat or two in to the game, and things slow down rapidly. But after weeks and weeks of Cypher System this was sort of tough to do with my Wednesday night D&D game. The slow-down of story progress and excessive emphasis on positional movement in combat became almost palpable. People were having fun, sure. But we weren't having Cypher level fun. The thing is, I know that this pace and feel isn't something unique to Cypher System...and I've even achieved it on plenty of occasions with different iterations of D&D, but Cypher stands out because the game system is designed from the ground up to emphasize and accent that style of play. I think a significant component of why Cypher can do this so easily and still feel like a rich experience was had despite a dearth of elaborate combat mechanics boils down to the fact that the system's core conceit (level mechanic for tasks) applies so well. It's deliberate de-emphasis on parsing out actions is a close second. Other games do this, too. Call of Cthulhu, for example, pulls it off without having a specially tailored mechanic, but instead by supporting investigative gameplay exceedingly well. You could play CoC or Cypher with maps and minis and worry about position....sure.....but neither game requires nor really encourages it; they shun those gameplay elements which can potentially pull you out of the moment. D&D has some issues with this, because sometimes you have seven PCs, 11 zombies, a skull lord and a gang of ibixians on the table, and you really want to know whether that player's fireball is going to hit the right # and miss her allies. Sometimes you need those minis on the board just to keep track of it all. I have run plenty of games where I never used a map and minis. Prior to 2003 I had never used such implements for D&D, and only grudgingly accepted that they made more sense with the way 3.5 was written. Sometimes, I have players who need that physical visual to understand what is going on. But also, sometimes I wonder if D&D deployed simple language for positioning, as Cypher System, 13th Age, and other games (T&T, for ex) do....maybe it would flow a lot better? Maybe then the need to drag out minis in complex combats would be less of an issue. People could worry less about whether their PC is standing at exactly the right distance for exactly the right 20 foot radius effect, and focus instead on being adjacent, nearby, far away or whatever scheme helps to track actions without going for the maps and minis. See, thoughts like this are why I am totally not digging the Pathfinder 2.0 playtest right now. If you're like me and love this game, or want to check it out, head to the Kickstarter and back it! I'm in at the "I Want it All" level and I really hope they hit the stretch goal for the Fairy Tale sourcebook. As it stands, the package offer includes the GM book "Your Best Game Ever," Cypher System second edition, a SF sourcebook, Horror sourcebook, Fantasy sourcebook, and a mess of character folios....already worth price of admission by cost alone, so with any luck they'll hit the final goal for the Fairy Tales sourcebook, too. "...von Däniken wrote of fabulous discoveries almost beyond description. The cave itself was cut and polished with advanced machinery to perfect right angles and smooth surfaces. They found furniture made of plastic and gold. There were countless fantastic artifacts and treasures, including lifelike statues of humans and animals, rooms plastered with precious stones, and a golden skeleton in a crystal sarcophagus. And at the heart of the cave, the metal library itself — consisting of thousands of metal and crystal plates, 96x48cm, precisely etched in an alien language and recording 250,000 years of history — and guarded by an elaborate system of active laser beams." I really want to drop that description in to a game soon, and explore the nature of that golden skeleton, in it's ancient immortal sarcophagus of crystal, protected by an "elaborate system of active laser beams." Maybe the only problem with von Daniken was he hadn't discovered RPGs? I sometimes feel like UFOlogy in general is a grand an elaborate LARP in which everyone willingly engages in self deception. This past weekend was session 6 of the ongoing Cypher System game, which focuses on a fantasy setting with liberal use of science-fantasy themes in its background. I also ran a one shot last Friday set in a distant post-apocalypse that was one part Fallout and one part Mad Max, with a dollop of Land of the Dead mixed in for completions' sake. All told, more good fun. What I'm realizing is that it is really easy to pick up and run with Cypher as a GM, and extremely easy to concoct genre-bending and twisting tales without much extra effort. I also had the one-shot roll tier 3 characters to see how different that felt from the tier 1-2 game that's been ongoing (everyone in that game has now hit tier 2) and it was interesting to realize that the "threat" felt about as consistent, largely because ultimately the PCs were more capable, but only if they were willing to be bold and spend the pools necessary to make life easier. With more pools, they could do this, but it means higher level threats can be hit....but also come with the harder hitting perks of being high level threats. The fact that the game still felt and played "the same" at the higher tier was nice, though. More stuff, more ability, but still the same level of underlying complexity is good. D&D 5E does this as well at higher level now. Motivation: Neuromorphs invade and consume the brain matter of other species through a process of psychic neurolysis. Neurolytic Degeneration: through a process of neurolysis the neuromorph’s mere psychic presence causes slow damage every round that someone is present. Each round targets much roll against intellect defense level 6 or suffer 1 point of Intellect damage if they are within 100 feet (long range) or a neuromorph. A target reduced to 0 Intellect in this manner will be reduced to a vegetable if not removed from the presence of a neuromorph within 1D6 minutes of reaching 0 Intellect. When a target reaches zero Intelect for the first time, the neuromorph heals 3 health. A neuromorph can, as an attack, directly focus on one target in long range and deal 6 intellect damage per round if the defense is failed. When this happens other targets in the ambient radius are spared for that round. As a last ditch effort a neuromorph can use its claws, but they only deal 4 damage and require a Speed defense level 4 to avoid damage; their bodies are weak compared to their mental abilities, and they have a might and speed defense of level 4 against melee attacks. Telepathy: neuromorphs speak via telepathy and can learn any language almost immediately. They can absorb the memories and knowledge of willing subjects in minutes, or unwilling subjects with a level 6 intellect defense check. 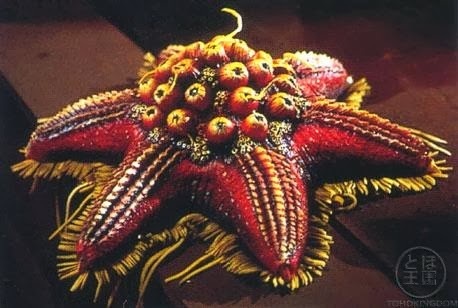 Description: neuromorphs have gangly, humanoid bodies attached to strange, multi-limbed “heads” that resemble starfish. Each long limb of the head ends in a series of smaller fractal limbs, which in turn seem to break down even further. The fractal nature of the neuromorph is a result of its strange existence within the “space between worlds” called the Intersticial Realm. Most neuromorphs cover up their humanoid body, exposing only their head and long claws. They favor colorful robes and garments. Neuromorphs hover slightly off of the ground in all circumstances and conditions, as if floating on a magnetic cushion, but they can be knocked down and they do not levitate if they are in a state of rest or meditation. Neuromorphs maintain a sophisticated society, but because they are made of a form of exotic matter which allows them to sustain their existence in the interstices, their ability to directly interact with conventional (baryonic) matter is limited. Specifically, they lack the technology or magic necessary to forge a bridge, portal or wormhole into the normal world, and regularly seek means of doing so, as well as engaging in hostility toward any who would invade the intersticial realm they call home. *Finding monstrous humanoids with a starfish-like head is harder than I thought. Interwebz, you has failed me. This short gazetteer outlines some information on specific regions in Chirak about which little information has previously been revealed, or only hinted at. Here, at last, are some details on the region of Helios and its surrounding areas. This area is covered on two maps. Helios has been locked in a generations-long battle with their eastern neighbors in Zann, but about twenty years ago the Sun King Khal’Hados, at only age 14, led an army through Zann to victory, conquering the region, slaying its kings, and putting the area under his control. Much of Zann consisted of semi-nomadic jungle tribes, but their cultural center was at the city port of Yenne, where the Sun King set down his armies and began building a new, grand city in his name. This conquest took three years. From there, Khal’Hados, eager to prove himself at only 17 years of age, turned the city over to his Death Priests and then looked to the south, across the gulf between his lands and Therias to the south. He commissioned a great fleet and sailed on Magdithar, which he conquered after only three months. Impressed with his success, but dissatisfied with the local folk of the island who were erudite scholars, he left a garrison and sailed against Sheddaham. Naval combat proved difficult against Sheddaham, however, as the foe was equipped with a sophisticated navy and after two years of conflict the Sheddaham was proving costly, when Empress Taminalia suggested a peaceful resolution: she offered up her daughter, Telos, as a bride with a significant payment in wealth to the young Sun King. Khal’Hados was at first hesitant, but when he met Telos he was smitten and married her, accepting unity between Helios and Sheddaham. Telos became the Sun Queen, and would eventually have her own palace in Elene. In the end, the Helian forces were routed, the Sun King nearly killed with a crippling wound. He retreated, and –shaken to the core—determined that he would amend his ways. Whether the Sun King has truly settled or not remains a question best left to his heirs. Though Khal’Hados now dwells peacefully in Sardkus at the ripe age of 34 with a crippled leg, his wife Telos of Ellene has born four children, two sons and two daughters, and her oldest son, Pethor, is now 14 years old, the same age his father was when he ascended to rule and began his conquests. Pethor is adept in magic and has already developed close ties to the Death Cult of Sathos, but he displays an acuity for battle and strategy as well. He now considers when his father will pass, and looks to other lands such as Xorias as possible sites of conquest. Beneath the city of Mazdigan, as the story is told, an ancient wyrm who was the vilest and most evil of the dragons who served Ga’Thon was slain in the Great War. This wyrm, a death dragon named Talax, was not truly slain, and its flesh and bones sank into the swamps of the region and permeated the land with its darkness. The city was first built by pilgrims after the Final War who heard the calling of the dragon, and were drawn to its inexplicable power. The first to truly understand this power and the whispers of the dragon was the priest Sathos, who founded the Death Cult in the dragon’s honor. He learned of new forms of immortality through undeath, and forged the first great citadels and tombs of the new necropolis which he built, draining the swamplands as he did so and protecting the land against the encroaching sea. Over the centuries the Death Cult became an obsession among those who would call themselves Helians, but not until the great exodus from the city of Not, which fell some three centuries after the Final War, when a great plague gradually wiped out the entire land. This plague was suspected to be the product of the rivers of blood of the god Ga’Thon poisoning the land, killing all in its wake. The Death Cults promised salvation and protection; the power of the vestige of the ancient dragon Talax would protect the pilgrims if only the accepted him as their new demiurge. The desperate refugees were willing, and so it was that distant Helios came to found a new kingdom along the coast. Today, the Death Cult is ubiquitous, and while the Sun King is regarded as something of a “living god” his status is never compared directly to Talax, who’s cult of Sathar reigns supreme. Sathar himself is believed to dwell, in deep undying slumber, beneath the Black Pyramid, the most notable ancient monument in the region. The Necropolis has suffered in some ways, however, as the vast collection of ancient monuments were built on low swampland prone to flooding and the dikes have failed countless times, leading to the majority of the old tombs and monuments being at least partially submerged in water. Mazdigan itself harbors many secrets, including a large number of willful undead forged by the most elite of the Death Cult. The desire to defy death through undeath has led to a painstaking process by which initiates and the desirable members of the cult may join in undeath, a gift by the Dragon, allowing them to continue to serve Talax and maintain the ancient Necropolis. Some estimate that there are more dead than living in the city, which is not at all off the mark. Polimark is a rival city along the northwestern coast which is known for its close trade connections with Helios. The ruler of the city is the Sun King's brother, who seized the city seventeen years ago during the period when the Sun King was invading Magdathar in the south. Regent Salgrath took the city with minimal effort, for its people were only recently liberated from an evil despot and there was little formal rule or government. He put it under Helian rule in the name of his brother, and later sent his armies to join his brother in assaulting Sabiri. He remains a threat to Enderas which is neatly sandwiched in between Helian holdings, as Salgrath has designs on expanding his own dominion of control, but his first effort to attempt invasion was soundly driven back by the fierceness of the Sindatherae and Enderans who stood against him. Worse yet, the giants of the Shaigothic Mountains have been a constant terror to his city, targeting it for raids every year out of capricious delight. This southern port is nestled in between Helian territories, and serves as a trade center between Therias to the south and Helios for those traders who fear direct interaction with the Sun King’s realm. Both Helian merchants and Therian merchants of Magdathar and Sheddaham congregate here. A large temple to the Raven Queen Morrigan rests here, where the people seem to worship her with unremitting respect, and a large culture of silvered elves calling themselves the Sindatherae live in the forest and beside the men of Enderas. Enderas has a bustling local industry dedicated to relic art replicas. The artwork is derived largely from pieces once found in the shaigothic Mountains, but the art is regarded as significant, even sacred with trade partners and the city prospers from this art trade as a result. Enderas is ruled by a Khallum, a sort of king who is called "Shepard of the people." The current Khallum is a Sindatherae half elf named Livias, and she is also a priestess of Morrigan. Though most of the human settlers in the region are believed to be a mix of Sheddaham colonists and old Helian pilgrims and refugees, much of the local political system is adopted from elven systems of rule, the role of Khallum in particular. The people of Enderas are ethnically related to Helians and Sheddahami, but speak a unique language called Enderic. The language bears no resemblance to any other local languages, and is only spoken in this city and neighboring communities in the Silverwood. Exactly why the people of this region gave up their old languages and learned a new dialect remains a mystery, even to the elves who claim that this was not a gradual change over time but a conscious choice made not long after the first settlers of Enderas arrived. Some strongly suspect that the adoption of this new language had to do with the mysterious ruins in the region, which early settlers plundered for relics and artifacts. Giants dwell in large numbers in the Shaigothic Mountains, all dedicated to the old Mountain God, who is said to have once been the greatest general of Ga'Thon, though others think the Mountain God is actually a Thousandspawn. It is believed to dwell a mile beneath the mountains, and speaks in mad whispers to the giant priestesses. The greatest dedicates sacrifice themselves to the Mountain God and return as Death Giants. Along the southern edge of the mountains, running for hundreds of miles intermittently can be found the Ruins of Shaigoth. This is an immense stretch of still intact ruins, partially subsumed in lava flows, of a strange greenish stone. The ruins are ancient, and some scholars think they were old and little understood long before the Ancients had their war. Within the ruins are still undiscovered chambers and buried secrets. Reaver's Deep is the name given to the Coastal region where a deep trench makes diving beyond the great shelf all but impossible. Stories of what dwells below are many, but entire cities of underwater denizens such as deepspawn, skum and kopru dwell in the region and occasionally make raids on the surface communities. Off the coast over the deeps is a strange device called the Silver Machine - a vast, floating silver relic of unknown nature hovering out over Reaver's Deep. Explorers have tried to penetrate it but the Skum and Kopru are vicious defenders of the object, which locals claim has been out there for at least four centuries. They claimed it descended from the sky, possibly called there by dark rituals of the fishmen. The Silverwood is the homeland of many coastal villages and elven tribes. The region is dangerous for travelers, for the giants of the mountains see fit to raid almost seasonally, but the many fortifications in this region reflect such troubles; most villages are clustered near or within large walled keeps designed to stave off attacks from thirty to fifty-foot-tall giants. There are a number of oddities in the Silverwood, including The Grand Aviary. Here, the ravens, rooks and crows of the Silverwood are sacred to Morrigan, and an ancient dome of lost ruins has been renovated into a sacred aviary from which all birds are protected and cared for. It is managed by the priestesses of Morrigan, and located south along the coast, overlooking Cualon Bay. Other impressive, ancient monuments forged by the elves long ago dot the forest, a tribute to the ancient culture of the Sindatherae. The oldest setting, classic fantasy since 1981! Espionage FUBAR (GUMSHOE, Night's Black Agents). Draconic Magazine - We've been smashing holes through reality since 1974. The important thing is that in a million years, when the brain-worms of Arcturus IX have annihilated us throughout the galaxy, there will be no surviving recordings of blogs to be found by the cephalopods that evolve to replace us. In this way will their civilization advance and prosper. All text copyright 2011-2017 by Nicholas Torbin Bergquist unless otherwise indicated.. Simple theme. Powered by Blogger.